We drive from Rotorua to Te Kuiti today. We are staying in Simply the Best B&B, a farm stay located in small community of Te Kuiti, which is located just a few minutes’ drive from Waitomo and the famous caves. This B&B offers pretty basic accommodation, so I’m not sure I agree with the name! We knew it was a farm stay (our first on this trip), but we were unprepared for our rooms having no closets or dressers, and having to share a bathroom. Their website states “3 double rooms with private bathrooms”, however only one of the three rooms has an en suite, and that room was not offered despite us requesting it. Also, there is no wireless Internet. The back bedroom my friends are staying in is very small – essentially only having room for the double bed, with nowhere to sit and relax. My room is a bit bigger with two single beds, a sofa, and two chairs, however it appears to be a converted TV or family room. It has a sliding door instead of a real door, which means I have limited privacy and no security. Despite these negatives, Margaret, the B&B operator is a real gem. She is exceedingly helpful, and makes our stay in this part of the North Island rewarding. Margaret recommends two restaurants in town, so we pick the first one and give it a try for dinner this evening. The Riverside Lodge is in a lovely location right by the river; however it is basically a bar that serves food. There are smokers all around, so we sit outside on the patio. Everyone looks at us as though we are from outer space and the service is exceedingly slow (we wait an hour). The food is good once it arrives. The day starts badly, since Margaret makes us instant coffee this morning. She also serves us a continental breakfast instead of the full English cooked breakfast we have had at all the other B&Bs so far. The fresh fruit and rhubarb compote for the cereal is nice, and the endless toast and homemade preserves are appreciated, however the instant coffee is dreadful. At Margaret’s urging, we drive out to the coast on Highway 37 to Marokopa, where there is a black iron sand beach. The beach and estuary area is quite spectacular. 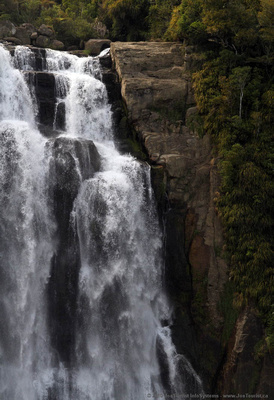 On the way out on the highway, we also stop to see Marokopa Falls, which is 15-20 metres high…an amazing sight. On the return trip, we see Mangapohue Natural Bridge, a land bridge caused by a river eroding limestone to punch a gorge through the rock. These are both great sights, and they are no cost. On our way home, we checkout the Waitomo Caves, but don’t go in since Margaret has booked us into the competing outfit Spellbound, which she promises is a better glow worm cave experience. We check out the competition while we are here, and find the rates are significantly more expensive than Spellbound. After we return home, Margaret makes us tea, which is very much appreciated. We go out to a nice restaurant tonight called Kai Cafe, which is run by a local young man and his French wife (who does the cooking). 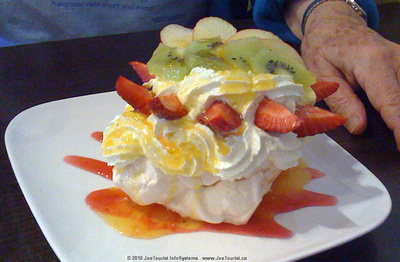 The meals are a blend of French cooking and local tastes. I have the Filet steak, which is a “Scotch” cut (unlike any filet I’ve had in Canada), however it is a very nice steak cooked to order, topped with a creamy mushroom sauce and accompanied by roasted potatoes, fresh steamed green beans, and a grilled tomato. My friends rave about their main course selections as well. Today after breakfast, we leave for a 10am booking at Spellbound, the glow worm cave and dry cave tour located in Waitomo. It only takes us 10 minutes to drive from Te Kuiti, and the tour starts promptly at 10am – ending around 2pm. Our guide Norm gives us a terrific experience along the way. First he drives us about 20 minutes west of Waitomo to the entrance to a private cave which has a stream running through it. We don a hardhat with a light, get in a zodiac boat and slowly go into the cave to see the glow worms. We learn these are actually maggots, however they are tiny. They do indeed glow, and glow brightly enough to light the inside of the cave once we turn off our headlamps and become dark adapted. The glow reflects off the water, and I can see the other 12 people in the boat. Norm hand propels the boat using an overhead cable, taking us within a few metres of a small waterfall before returning us to the landing. We then walk back to the entrance, leave our hardhats, and walk a few metres to the “coffee shop” where Norm makes us instant coffee, tea, or hot chocolate made from hot water stored in thermos. Biscuits to dunk complete the offerings. Toilets are also available nearby. There are wild Turkeys roaming in the pasture as we walk for five minutes to the dry cave, where Norm tells us he was one of the founders. 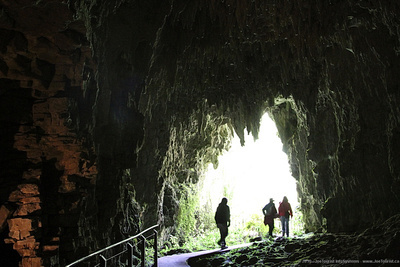 It is a superb cave with a walkway that goes for perhaps 300 metres or so. There is a large gallery, some air shafts, other entrances to see, and of course lots of stalagmites and stalactites. There are also some animal bones: some you would expect such as farm animals and possums; however there is also a skeleton of a Moa, an extinct bird which had a trachea, hip bones and big thigh bones. After exiting the dry cave, Norm takes us on a drive over some farmland along the ridgelines, and finally returns us to the starting point. This evening we return to Kai (now called the Bosco Cafe) for our last dinner in New Zealand (and of the trip). I have the fish of the day (Snapper), which comes with oven roasted potatoes, green beans, and a very nice pesto topping, as well as some salad around the plate: a quite novel presentation with the salad. When we return to the B&B I get serious about packing – tossing out heavy paper and other stuff that is now useless. We settle our accounts with Margaret for our stay, however she only accepts cash, so that makes it a bit inconvenient. All the other B&Bs accept credit card payments. We have breakfast a bit earlier this morning, say our goodbyes to Margaret and her husband Graham, and leave for the Auckland airport by 8:30am. This entry was posted in New Zealand and tagged beach, cave, caves, coastline, falls, fish, food, hotel, mountains, restaurant, river, valley, waterfalls. Bookmark the permalink.